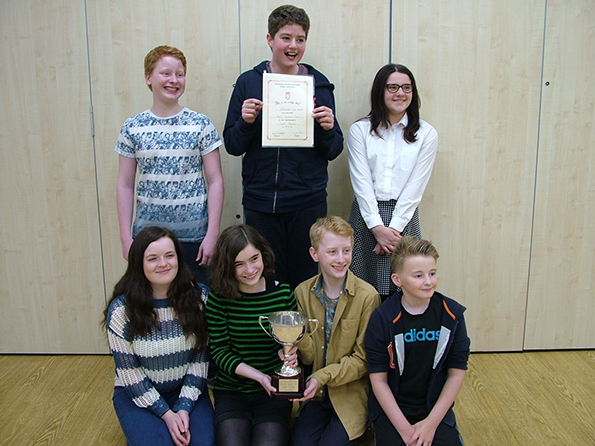 Ravenshead Youth Theatre Group have won the prestigious Best Play Trophy at this year’s NANDA Youth Theatre Festival with their performance of ‘A Dog’s Life’ by Pam Valentine.The Festival took place on Saturday 7th May at Friesland School in Sandiacre, bringing together other youth theatre groups from all over Nottinghamshire to compete in a one-act play competition. “A Dogs Life’ is set in a dog’s home and features 5 members of the 7 strong cast playing the parts of various breeds of dog, all of them hoping to be chosen by a visitor who is looking to adopt a rescue dog. The dogs have a unique view of many aspects of human behaviour in a script that is both comic and poignant. RYTG had another reason to celebrate as Lewis Hallam, playing one of the excitable puppies, won the award for Best Actor aged 11 years and under. The adjudicator, Stephen Godward, praised the RYTG cast for the strength of their characterisation, their attention to detail and their accuracy.